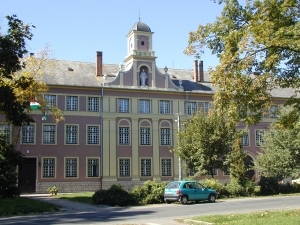 The second largest town in Tolna county, it lies 29 km from Kaposvár and 45 km from Pécs on the boundaries of three counties: Tolna, Somogy and Baranya. 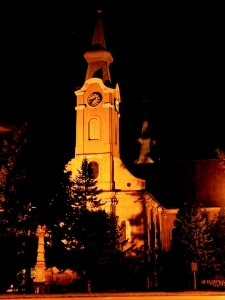 Splendid Baroque altars and a pulpit, a listed monument, are to be seen in the special, two-spired Baroque church with a transept built in 1725 in the old centre of the town, now called Arany János tér. 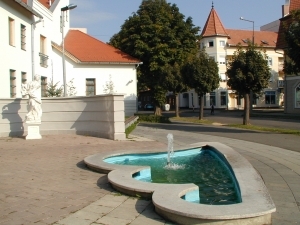 A museum commemorating István Fekete, the famous author of animal stories was founded in the garden district of Dombóvár. Sights include: ruins of 'Gólya Castle', 18th century Roman Catholic church, István Fekete Museum, Museum of Local History. Among the most significant places of excursion in the vicinity of Dombóvár are Nyerges Forest on the ouskirts of the town, the anglers' lakes at Tüske gaining national distinction, the Medicinal and Open-air Bath at Gunaras with pools of water of various degrees of temperature in a territory of more than 6 ha. The Kossuth sculptural group, the work of János Horvay, which for a long time had been set up in front of the Parliament, has found its new place among the old oaks of the Szigeterdő Nature Conservation Park. The members of the first responsible government of Hungary are portrayed by the work of art declared to be a national monument.